There's definitely a hint of spring in the air and a spring in my step, so I've planned a zingy little workout for today. There's a lot of buzz at the moment around The Ninety-Nine Workout, and I've read about it on various blogs and fitness sites including TheySmell.com, where blogger Kim described how the workout took her about an hour and 6 minutes to complete, go girl! It's basically just a shortened version of the The 99 Workout, doing the last 5 sets instead of all 9. I'm hoping the routine will take under 30 minutes to complete including the run, plus warm-up and cool down stretches. 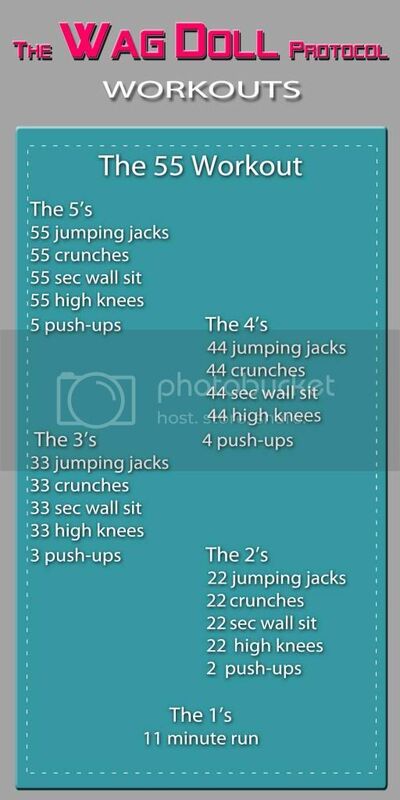 The exercises are straightforward, jumping jacks to get the heart rate up and crunches for ab work. The wall sit exercise obviously needs a piece of equipment...a wall! Squat down with your back flat against a wall, knees bent at 90 degrees and thighs parallel to the floor, hold for 55 seconds for the first round, 44 seconds for the next etc. High knees are a great cardio and leg workout, and push-ups...well you know push-ups are one of my favourite upper body exercises. So how did I get on? Well my timing prediction was spot on. It took me exactly 28minutes 45seconds so fitted perfectly in my 30 minute window! I did a couple of minutes of warm-up stretches before the routine and cool down stretches after and these are included in the time. I loved the jumping jacks and high knees, great calisthenics exercises. I felt like there weren't enough push-ups, give me more! And the wall sits were a welcome break from cardio based exercises, giving my quads a good workout. But good grief... how terrible were my crunches?! I knew I'd struggle with these, I do core exercises but never do crunches and it showed. I'm sure we all know that feeling in your abs, the burn...and then they stop working LOL! I struggled through the numbers, pulling an impressive variety of faces and trying to keep good form. Yep, think I need to add a few crunches to my workouts in future. And the run...ahhh the 11 minute run. Well I huffed and puffed my way through it. I often do a 10 minute run at the start of my workouts and this was only 1 minute longer. But doing the run after the HIIT exercises made it so much harder, my fuel had been used and I was running on empty. Just goes to show, it's good to shake it up, do different workouts and do them in a different order. I really enjoyed The 55 Workout and will definitely do it again, in fact I'd like to give The 99 Workout a go...that's a heck of a lot of crunches and I'd better get practicing! This is fantastic Wag Doll, it sounds very difficult! Glad you managed to get through it and now you have another goal to conquer... The deadly crunches! Nice to see you mixing it up! Thanks edmahoo, yep got a lot of work to do on those crunches LOL! This is my kind of workout too. Tell me how many times to do it, I'll do it, and then it's over. Thanks for sharing! Exactly! I like to know the end is in sight LOL! I'm liking the look of your new workout plan layouts. Very easy to read and follow... Loving it Wag Doll.